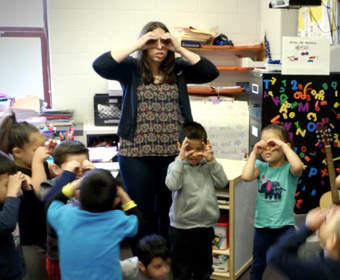 Large group and Small Group focuses on the teacher facilitating student intellectual engagement through minds-on learning with large learning concepts as well as specific content-focused learning standards. 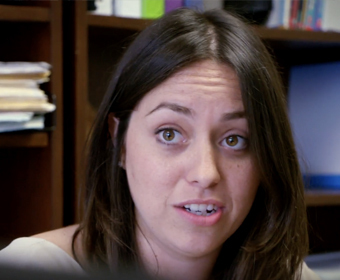 The centers provide time for students to apply their knowledge and skills with their peers and adult facilitation. 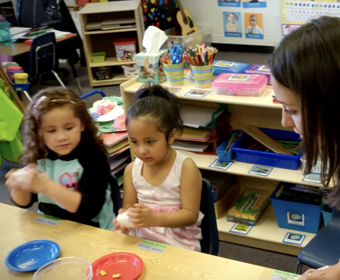 All three phases of early learning instruction are focused on the “learning tasks requiring students to engage intellectually, to think; some may involve productive struggle” (Cluster 4: Student Intellectual Engagement 2b/3a/3b/3c). 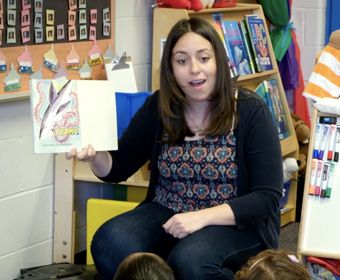 In “Eva’s Instruction Part 1: Whole Group Reading/Language 0.00 to 4.15, pay special attention to how Ms Eva uses chants, songs, visual cueing to involve students in building their literacy/vocabulary/listening skills around a theme-based read aloud. Differentiation and customized learning is a key in small group learning. 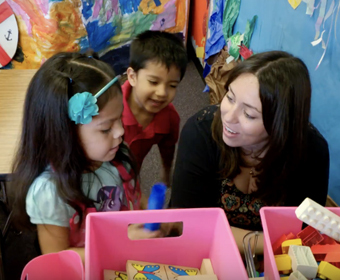 During this part of the instruction video you will see how Ms Eva differentiates instruction for the two small groups that WILL NOT be working directly with her. One group, her youngest/lowest math learners will be working independently on “Exploring objects and patterns” (LEARNING STANDARD 8.A) by making a simple ABAB pattern bracelet. The second small group, her average math students, will be working with Ms Vicki (teaching assistant) to “Compare quantities using appropriate vocabulary terms” (LEARNING STANDARD 6.D) through the development of a sea life math story. We then get to see Ms Eva working directly with her highest math group to extend their learning for “Demonstrating beginning understanding of numbers, number names, and numerals” (LEARNING STANDARD 6.A). Take a look! In “Eva’s Instruction Part 3: Centers from 8.58 to 12.09, you will see how the child-initiated centers are all focused on learning through the sea life theme. 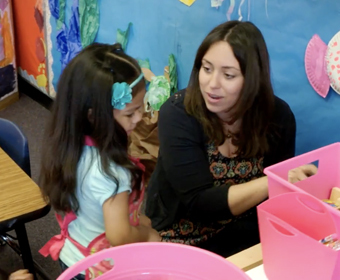 The classroom centers, developed to a large degree by the students, reflect and extend the teacher-directed learning that they have been doing in the large and small group lessons. Purposeful learning through play! There is also a classroom student art gallery and display of family-based research projects that are often a result of all three parts of the teaching/learning process. This Video is very informative!